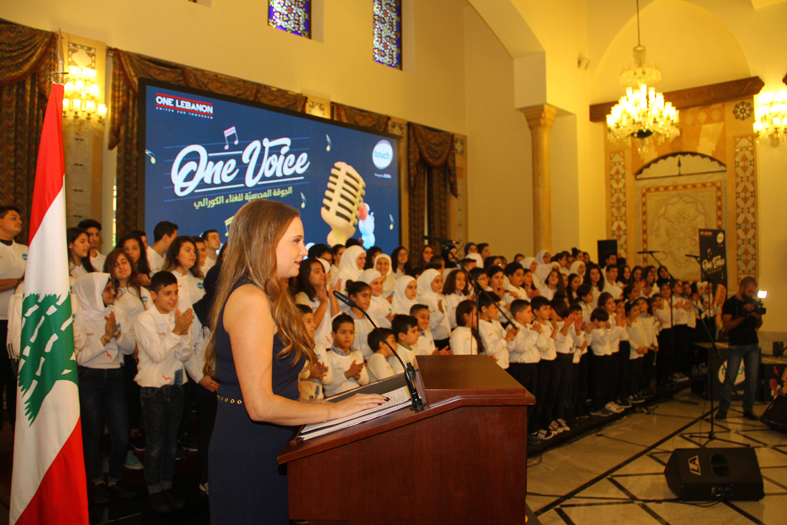 One Lebanon, in partnership with Touch, the leading mobile telecommunications operator in Lebanon launched the One Voice initiative. The project seeks to provide professional choir sessions to students with no access to music in four public schools in Beirut, in cooperation with professional choir teachers from Tania Kassis Academy. The initiative was officially launched during an event held at the Grand Serail under the patronage of Prime Minister of Lebanon Saad Hariri and in the presence of Minister of Telecom Mr. Jamal Jarrah, Minister of Information Mr. Melhem Riachi, many ambassadors, ONE LEBANON Founder & President Tania Kassis, touch CEO Emre Gurkan, and other personalities. President Riad el Solh Secondary School, Gebran Ghassan Tueni Secondary School, Chiah mixed English School and Martyr Abdel Karim Khalil English middle school are the four public schools representing Beirut’s confessional diversity that were selected to participate in the program. Students selected are being provided with one-hour choir sessions on a weekly basis during school hours all along the 2018/2019 academic year. The four groups comprise an average of 30 students per group where two groups are allocated to ages 7-13 years and two groups are allocated to 13-16year-olds. This partnership, in collaboration with the Ministry of Education, is fundamental to providing youth in Lebanon with innovative and fun ways to learn. Tania Kassis pronouncing her speech. ONE LEBANON’s goal being to initiate, develop and support projects that encourage citizens to live together harmoniously in a peaceful Lebanon, it seeks to promote through this project respect for diversity, both individual and collective and seeks to uphold ethical integrity among the Lebanese Youth.